Marshes and wet hollows, often in shallow water at the edges of ponds and lakes. 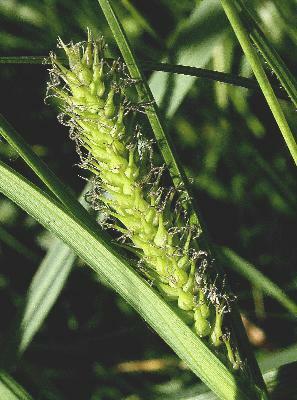 Carex atherodes often grows in deeper water, frequently 6–9 dm, than any other Carex species, and sometimes specimens from such habitats will have pubescence evident only at the summit of some of the leaf sheaths. The vegetative culms of this species are hollow, allowing their easy recognition, even if pubescence is hard to see. Hybrids with C. trichocarpa are suspected from Monroe Co.
MICHIGAN FLORA ONLINE. A. A. Reznicek, E. G. Voss, & B. S. Walters. February 2011. University of Michigan. Web. April 24, 2019. https://michiganflora.net/species.aspx?id=910.